Vaccines are drugs used to increase the body's ability to combat disease organisms. Most vaccines are designed to help the body fight off a specific type of bacterium, protozoan, or virus. Some vaccines have been developed to stop the growth of cancer cells and to protect military troops from biological warfare. The administration of vaccines to animals and humans is called vaccination or immunization. Vaccination is one medical strategy for preventing the spread of infectious diseases. Vaccines encourage the body to build up immunity against disease organisms. In 1796, an English physician named Edward Jenner developed the first vaccine to protect people from smallpox. Smallpox is caused by a potentially fatal virus that severely blemishes the skin and internal organs. Jenner noticed that cattle handlers infected with a related disease called cowpox did not contract smallpox. Jenner used this observation to test whether exposure to cowpox prevented people from getting smallpox. He introduced the fluids from a cowpox sore into the arm of a young boy. The boy developed cowpox, a mild disease in humans, but did not get smallpox after Jenner exposed the boy to the smallpox virus. (This highly unethical experiment could not be performed today!) The word "vaccine" comes from the Latin vaccus, meaning "cow." Today, smallpox has been effectively eliminated from the human population through vaccination. Vaccines for vaccination are made from the disease organism. They are composed of either a weakened ("attenuated") form of the live disease organism, the killed disease organism, or chemical components of the disease organism. The cowpox fluids collected by Jenner contained live viruses that he scratched into the boy's body. Vaccination works by stimulating the immune system to produce antibodies against the disease organism. It takes a few days before the vaccine can protect the body, but the antibody -producing cells impart an immunity that can last several years to a lifetime. Booster shots are sometimes given years after immunization with an active vaccine to extend the body's immunity. Many vaccines must be given as several small doses over a six-month or one-year period. This prevents the person from being ill from a large dose given at once. Vaccination is used against a variety of common diseases including diphtheria, polio, rabies, and tetanus. Development of vaccines against HIV (human immunodeficiency virus) and malaria are two of the most active areas of research in twenty-first-century medicine. How vaccines work: A. Vaccines containing antigens are introduced into the body, stimulating the immune system response by instructing B cells, with assistance from T cells, to produce antibodies. 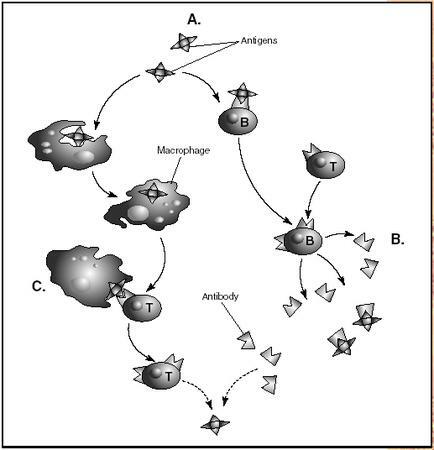 B. Antibodies are produced to fight the weakened or dead viruses in the vaccine. The immune system prepares to destroy real and stronger viruses in the future. C. When new antigens enter the body, white blood cells called macrophages engulf them, process the information contained in the antigens, and send it to the T cells so that an immune system response can be mobilized. Many people are concerned that vaccines can have side effects in certain individuals. Several children have fallen ill from the DPT, or diphtheria-pertussis-tentanus, vaccination. Most illnesses from vaccinations are found in individuals who are allergic to the vaccine. Vaccines made from living organisms may cause the same illness physicians are trying to prevent. The oral polio vaccine, containing weakened virus, is designed to remain in the environment after defecation by the person ingesting it. This exposes other people to it, immunizing them. However, a few people exposed this way have contracted polio. The injected form of the vaccine does not carry this risk, but neither does it help immunize other people. Another form of protection against disease, termed passive immunity, relies on injection of antibodies into the blood. These antibodies perform the same function as a person's own antibodies, attaching to the disease organism and acting as a label that tells immune cells to kill and remove the organism. These antibodies may be collected from laboratory animals immunized against the disease, or may be produced in cell cultures from special cells called monoclonal antibody cells. Passive immunization permits a person to have the protective antibodies already in the body before getting ill from the disease. Passive immunization works immediately after being administered, but gives only temporary immunity; the protective value may disappear after several weeks. Passive immunization is commonly given during influenza or "flu" outbreaks (but is not the same as a "flu shot," which is a true vaccine, given before exposure to the virus). Antivenoms used to treat the bites or stings of venomous insects and snakes are antibodies, and therefore are a form of passive immunization. Nester, Eugene W., et al. Microbiology, A Human Perspective, 2nd ed. Dubuque, IA: WCB/McGraw-Hill. 1996. French scientist Louis Pasteur was the first to develop a way to produce effective vaccines. Pasteur's first vaccine was derived from attenuated cultures of the disease organisms. Developed in 1879, it was for fowl cholera found in chickens. The first vaccine he used on humans was for the deadly viral disease rabies.